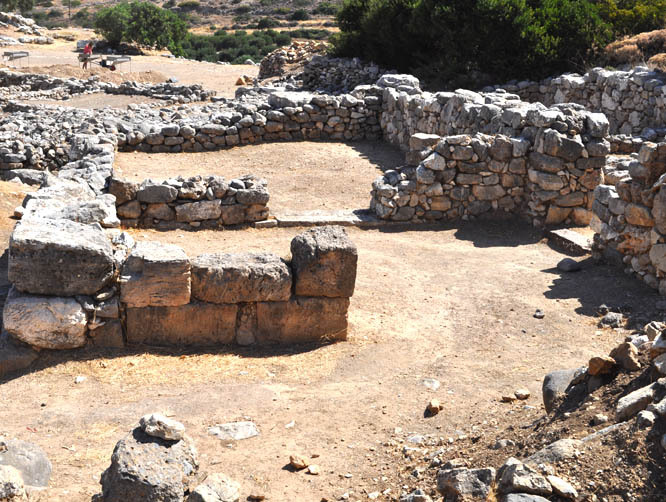 We revisit the Minoan town of Gournia to learn what new things have been discovered at those excavations. Sadly, we find the project is wrapping up for the summer. Many of the student workers are gone, and some of the areas are covered with heavy fabric and soil, to shelter them from the weather. 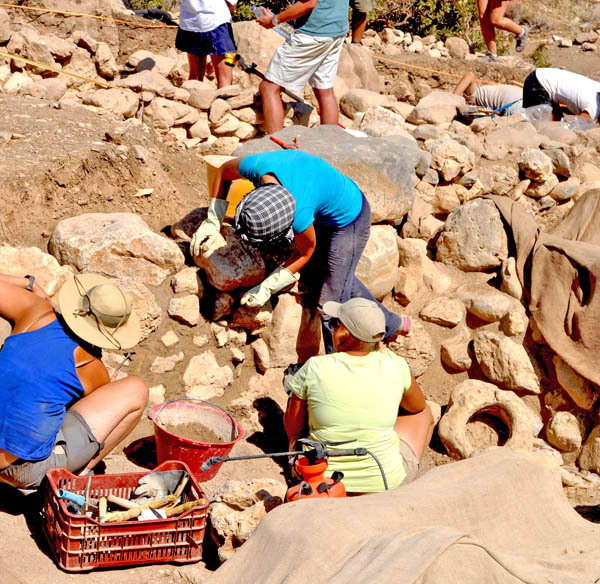 A few excavations are still active, as teams struggle to complete final tasks before leaving the site. Dr. John Younger and his team are focused on the same area as last year, determined to finish their work. They have made great progress since our last visit. 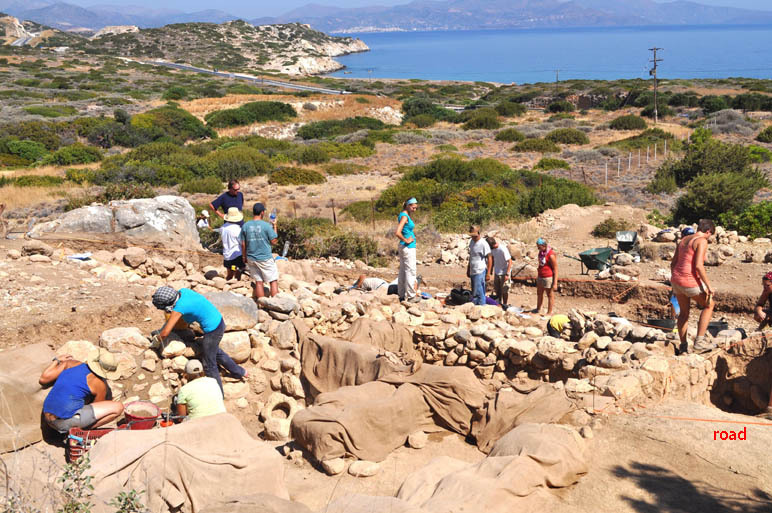 John explained that his team had uncovered older layers and artifacts, revealing more information about earlier generations of Minoan inhabitants. 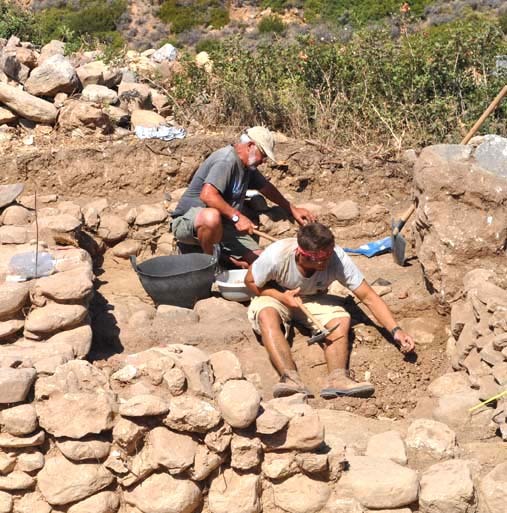 Just north of his dig, another team has excavated additional buildings and what has been identified as the main road to the Gournia harbor. The road is broader than the little lanes in the town itself. It was certainly intended for heavier traffic, such as cargo being hauled to and from merchant ships. Parts of the excavation are already covered, but workers are laboring in other areas – trying to meet today’s deadline. East of this site, where excavation was barely underway last year, several house foundations have been uncovered. A cobblestone lane has also been exposed. It is an extension of the lane that continues uphill to the palace. Dr. 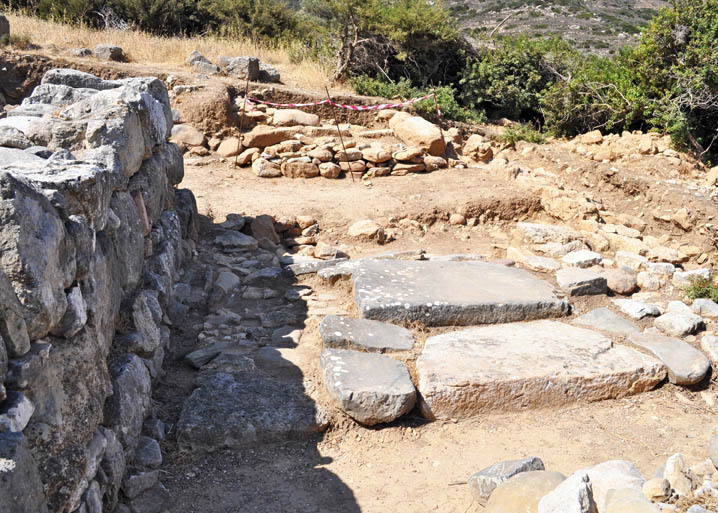 Younger suggests we visit what has been labeled “The Mycenaean House,” on the southeast side of town. That excavation was suspended by the Ministry of Culture (due to a permit mix-up), but the team made an exciting discovery before shutting down. 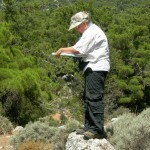 We hike up the hill and beyond the palace complex, to the Mycenaean dig. We watched this excavation progress over the past several years. The main structures here are clearly post-palatial. That is, they were built after Crete was invaded by Mycenaean Greeks – ending the Minoan empire. 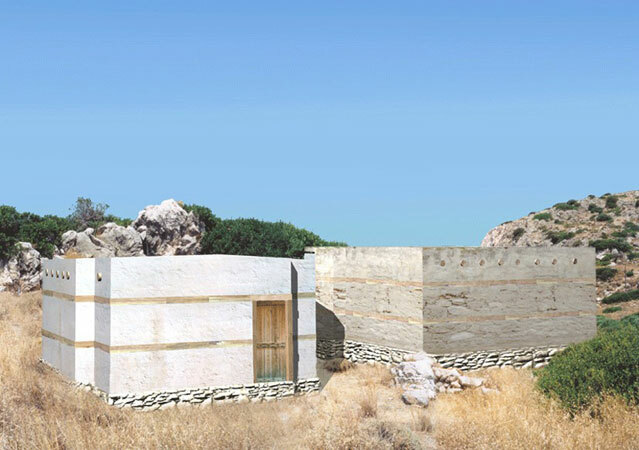 The Mycenaean building is constructed in typical cyclopean style, using huge stones more suitable for fortress ramparts than for normal buildings. It is very different from Minoan structures. The new discovery made during the short time the team worked this year, is a gateway. 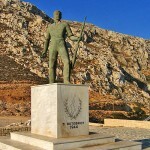 This opens on a road leading the isthmus of Ierapetra, which is the most fertile flat area of Crete, and the easiest route to the Libyan Sea. Some experts suggest this is the reason Gournia was built here. It is ideally situated for cross island trade. 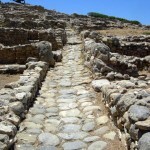 This trade route may have been on the minds of the Mycenaeans, which makes their gateway even more noteworthy. Except for the large base stones, there is not much to identify it as a gate. 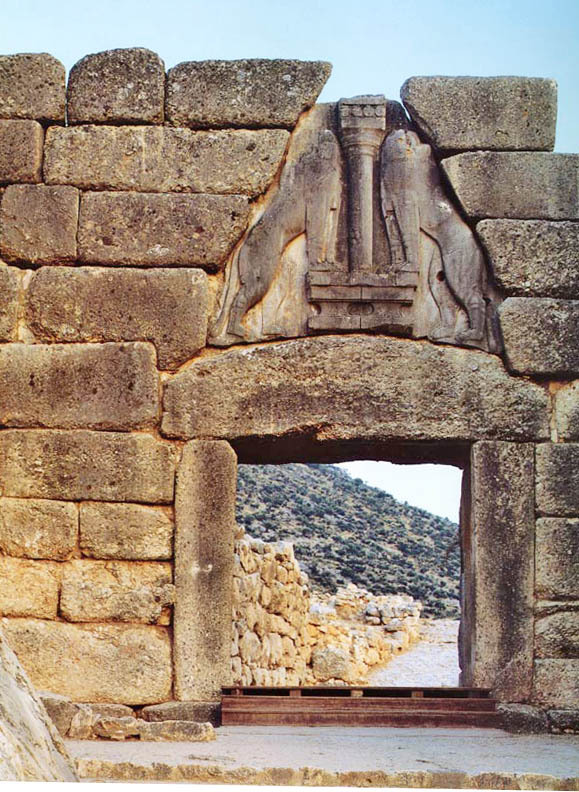 However, the measurements and calculations made by archaeologists indicate this gateway is larger than the Lion Gate of Mycenae itself. That is impressive for such a small port town. On our way out of Gournia, we stop at the ancient cemetery. It is located on the slope to the north and consists of eight tombs, of which only four are visible today. 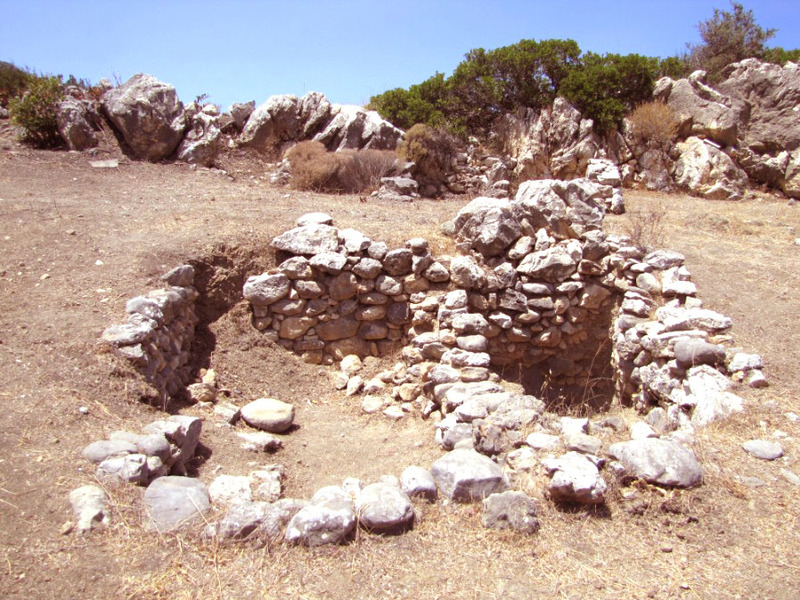 Minoans did not build tombs until they began to build monumental structures (such as palaces). Before that, they buried their dead in graves. 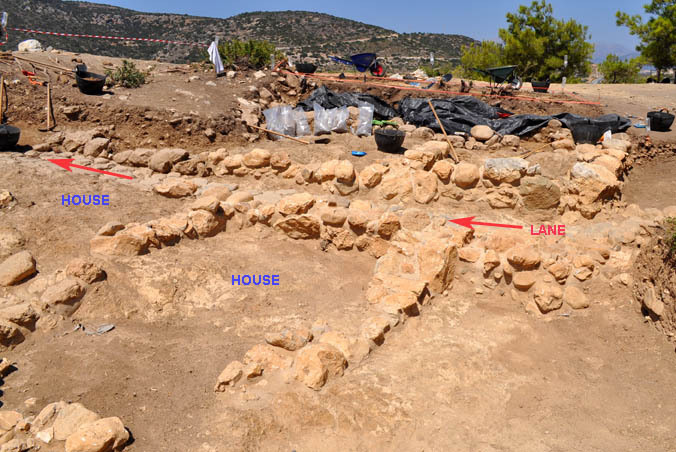 In early and middle Minoan periods, tombs appear to imitate domestic structures, which is why they are called ‘house-tombs.’ Some experts theorize that Minoans viewed the world of the dead as a copy of the living world. This would explain why they built houses and furnished them with the dead person’s belongings. The richness of grave goods may reflect the social status of the tomb occupants during their lives. An altar and stone kernos (for offerings) indicates ritual activity at the tombs. 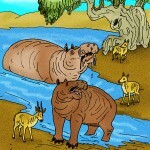 Perhaps families visited their departed relatives to offer provisions and the latest news about the living world. There is so much more to learn about the ancient Minoans, how they lived, and what they believed. It will take time, as researchers continue to excavate and analyze new evidence.